Roy Keane and Martin O'Neill during last night's game against Wales in Dublin. MARTIN O’NEILL and Roy Keane have come under increased pressure following Ireland’s deflating 1-0 defeat at home to Wales in the Uefa Nations League last night. It means the Boys in Green are on the brink of relegation from League B with Ireland yet to secure a victory after three games, as a result posing a significant threat to hopes of qualifying for the European Championships in 2020. Last month’s 4-1 defeat in Cardiff was widely criticised, however a 1-1 draw at home to Denmark combined with yesterday’s defeat against Ryan Giggs’s men sees Ireland now sit bottom of their group with just one point from a possible nine. O’Neill and his management team have beared the brunt for much of last night’s display at the Aviva Stadium. Derby winger Harry Wilson’s brilliant free-kick after 58 minutes was the difference on the night as Ireland once again struggled in the final third. 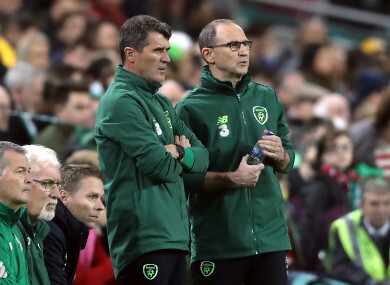 O’Neill and Keane were appointed in 2013, with the pair’s record currently standing at 53 games (both competitive and friendlies), with 19 won, 18 drawn and 16 lost. They led Ireland to the knockout stages of Euro 2016 and to a World Cup play-off against Denmark at the end of 2017. However two heavy defeats in-a-row (5-1 at home to Denmark and 4-1 away to Wales) has put the spotlight on their tenure in charge. Yesterday’s loss means Ireland have just one win in their last nine games, with the country’s last competitive victory coming a year ago, when James McClean’s goal secured a memorable World Cup qualifier win away to Wales in October 2017. Should the FAI keep faith with Martin O’Neill and Roy Keane? Email “Poll: Should the FAI keep faith with Martin O'Neill and Roy Keane?”. Feedback on “Poll: Should the FAI keep faith with Martin O'Neill and Roy Keane?”.